In January, I decided to take up Jane Hart’s Ten Tools Challenge. I’ve already blogged about my Tool #1, Explain Everything, and here is my tool #2 (ok, ok I’m a bit behind schedule): Prezi. As many of you know, Prezi is a zooming presentation tool – an alternative to PowerPoint and Keynote. It lives online and, with a free account, you can create your own Prezis that also live online (or you can download them to your desktop). Here’s a good example of a well crafted prezi, featured on the Prezi site, to give you a feel for what’s possible. While I’ve used Prezi in the past, I’ve just recently surfaced from a Prezi-deep-dive – five presentations (on wildly different topics) in one month. So it seems like a good time to reflect on its strengths and weaknesses. First, a little about how Prezi works. Unlike Keynote and PowerPoint, where the navigational metaphor is a series of index cards or slides to progress through one to the next to the next, a Prezi presentation exists on a large (endless) canvas. 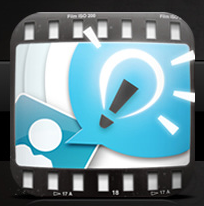 You plop content (text, images, video) down on the canvas in any order and then create a pathway through your content. 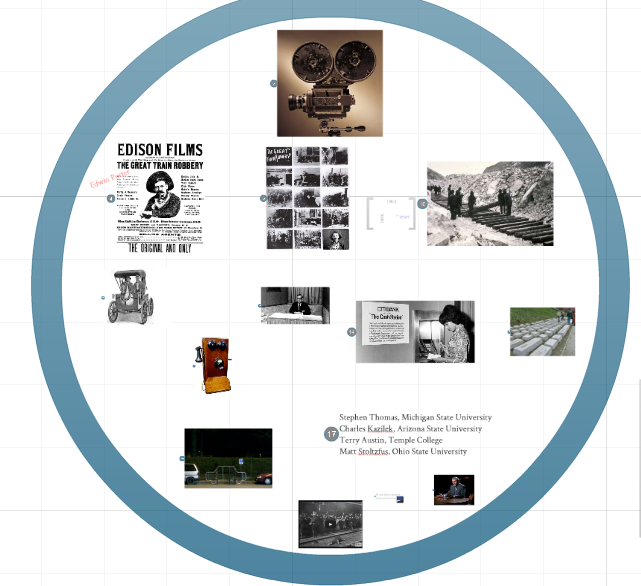 Part of a Prezi, showing various content pieces in a frame. The blue circle is a “frame” and the little content bits and bobs within the blue circle are all related to the topic of that particular frame. Once you upload your content into the frame, you then decide in what order to display them. Here’s that same frame of content, with the “pathway” turned on. Same Prezi frame, with the editing path turned on. Easy modification. Whenever I am asked to give a talk, I usually reconfigure the content to reflect the interests of the group. Sometimes I add new information, cut back on less relevant things, or change the order to accommodate schedules. By having all of my content on one canvas, I can easily change the pathway and modify for a new audience. All the content is still there (on the canvas) but may not be included in this particular pathway. Focused attention. The zooming capability makes it possible to focus the viewers’ attention and indicate emphasis in a dynamic, visual way. This is particularly useful when you want to emphasize forest-to-trees relationships. Visual context. If used well, Prezi can help you do a better job of using physical space to assist your audience and help them remember how the parts of your talk relate to each other. Easy importing. You can import a PowerPoint slide deck to Prezi. While the import function works well, you have to massage the slides to take advantage of the zooming and other features. Keep in mind that animation effects you created in PPT, won’t survive the import. Easily displayed and shared online. Since Prezi is an online tool, it is easy to neatly (without ads or distractions) embed it, display it, or share a link. Of course, you can use SlideShare or Speaker Deck to do that with PPT and Keynote files. Oh, there’s a Prezi iPad app too. Helpful tutorials. Prezi’s done a very good job with video tutorials and masterful cheat sheets on their website. Nicely done. It’s a bit gimmicky. 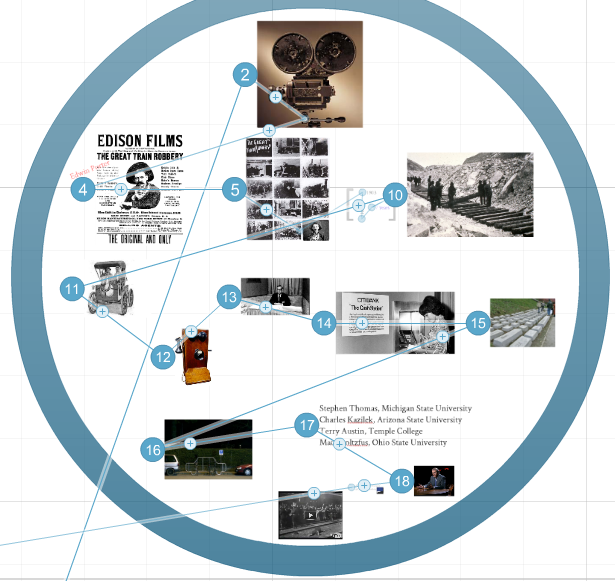 If you want to be precise about it, Prezi is still a linear presentation tool. Afterall, you are just proceeding along nodes on a linear path. Those that complain about death-by-PowerPoint could still complain about death-by-Prezi. But I do feel that using this tool urges me on to be more visual in my thinking. You don’t own it. Because your presentation lives online, it’s got all the advantages and disadvantages of a cloud-based existence. Namely, you can access it from any where and easily share it. But, you could also loose it (Prezi could go belly up). Size limitations. Prezi works on a Freemium model. The free public version gives you 100MB of storage space (enough for 4 or 5 Prezis). To get 500MB of storage space you have to pay $59/year. (2GB for $159/year). I found the limits of my free allotment when I created a Prezi that included four short video segments. Motion Sickness. Some people complain that swooping Prezi’s give them a headache or make them feel slightly nauseous. As one prone to motion sickness myself, I’m always careful to limit the amount of swooping and turning. Using frames, being judicious about effects, and strategically positioning your content (shortening the path points) makes this easy to control. As you can see, advantages and disadvantages. I would say that when I sit down to create a PPT or Keynote “deck”, I always just open the application and start plunking things down. With Prezi, my first instinct is to create a storyboard, so that I can understand the whole of what I’m trying to accomplish before I get into the trap of bulleted-list thinking…and that just feels like a good thing. In January I decided to take Jane Hart’s Ten Tools Challenge, committing myself to learning one new tool per month in 2013, by building/using/creating with it. I’m already a bit behind, but gamely marching on – here is my Tool #1 – Explain Everything. 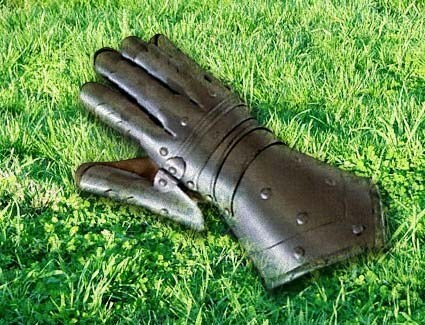 So, thoughts about this tool. It’s very easy to use – I figured it out by trial and error in about 15 minutes. If you want a more structured learning experience there are manuals on their site and even an iTunes U course. I like the easy importing and exporting features. The drawing palette is a bit limited, but there’s enough there to give you the basics. One thing I noticed, if your project consists of multiple static images – proceeding from one to the next – there is a hiccup in the load (at least there was for me) that you have to take account of in your recording. In other words, pause in your explanation while the project is loading from one image to the next. This ‘Challenge’ is a great way to formalize what I need to do anyway – get inside these new tools so that I can fully understand their capabilities. Jane Hart has thrown down an intriguing 2013 gauntlet: commit yourself to learning how to use ten new technology tools in 2013. What a great way to walk the talk. I often extol the teachers I work with to invest time to learn new tools or adjust their use of frequently used tools. Afterall, learning how to use a new media tool is the perfect place to be in order to help others do the same. Beginner’s mind has a way of helping us to find new approaches, fresh perspectives, and empathy. In her blog post about the challenge, Jane suggests you devise your list of new tools (ok, I’m working on it), go public with your commitment and write a blog post about your plan (check), tackle one tool per month (gotcha), and blog about the experience each month with a final, culminating blog post at the end of the year reflecting on the whole experience (righto). I love this idea. Not only does it give some structure to something that I should do anyway, Jane will network the people joining her in the challenge so that we can all learn from each other. I’m already learning as I read the blog posts of others taking up the challenge…like Joitske Hulsebosch (Lasagna and Chips), David Kelly, Michael Mades, and Tracy Ross. So, I accept your challenge, Jane. And thanks for extending it!